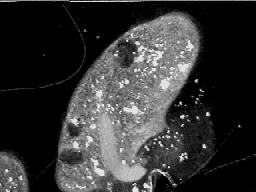 Paramecium Caudatum - Exposed to 1150 Hz - Undergoing Evisceration and Disintegration, from Plasma Wave. The Seventh International Rife Conference! The Seventh International Conference on the technologies of Dr. Royal Rife will be held October 1-3 , 2004 in Seattle, WA., USA. Various lectures, papers, and open discussions on the technologies of Dr. Royal Rife will be presented. Please see the conference website for more information. AVI video of exploding Blepharisma organism after exposure to the plasma wave generated by my instrument. 1.9MB, needs Windows 3.1, 95, 98 or other AVI viewer.Run time is about 15 seconds. This narrated 115 minute video tape consists of two parts. The first half shows a variety of Protozoan micro organisms being destroyed by the plasma wave originating from the device. This was accomplished without direct connection, through the air, from a distance of about four to five feet. My device is the ONLY instrument in the world that has shown the ability to produce such an effect. The second half of the video shows you in a step by step process how easy it is to actually construct and operate my device. The VHS tape is available in both NTSC (Northern Americas' TV i.e. Canada, US, and Mexico system format, and European PAL formats only! South American PAL and Asian SECAM are not available. Go to the the end of this document for ordering information. Resonant Light Technology Inc. is proud to announce the first Rife/Bare instrument for sale that has Health Canada approval. Health Canada, is the Canadian equivalent of the US FDA. If you are in the market for a quality frequency instrument with government approval,( important to Canadian Health Care Professionals! ) this is it! The Resonant Light Technology Inc., PERL instrument is an advanced, fully enclosed and programmable Rife/Bare instrument. It offers simplicity of use with minimal user involvement. Frequencies and their control are generated by a programmable miniature dedicated computer. Options allow the PERL to output up to three frequencies simultaneously, thus reducing total exposure time by 1/3rd. The PERL instrument is built under license to my electrical specifications and is constructed by a company with years of experience in both Rife/Bare instruments and customer satisfaction. If you are ill with a non medical health care condition, please see a practitioner of natural therapeutics. Copyright 2003, by Plasma Sonics Ltd. Co. This introduction reviews a book I have written, a book which one may use to construct their own functional Rife/Bare instrument. This instrument utilizes patented methods and techniques to produce a modern day recreation of a relatively unknown therapy device. A device first created and tested in the 1930's by Dr. Royal Rife, and then lost to humanity for the next 65 years. Clinical applications and success with Dr. Rife's machine extended through the 1930's, with treatment of a wide variety of diseases. The late 1930's witnessed the founding of the Beam Ray Company to commercially produce the device. By the mid 1940's, the technology behind Dr. Rife's device was essentially lost. The Beam Ray Company had self destructed, and the scientific accomplishments of Dr. Rife became more urban legend than fact. Dr. Rife's legacy exists in the estimated 400,000 frequency devices that are presently in use here in the USA. Some of these instruments are very effective, others have limited capabilities . My book is not the story of how the technological discoveries of Dr. Rife were lost, rather my book - manual is about how you can easily recreate a device that is similar, and in many ways superior to, Dr. Rife's, yourself. The many intervening decades from Dr. Rifes' time to our present day has seen the discovery of many new electronic theories and technologies. It was not possible until the past few years to explain or understand how Dr. Rife's instrument functioned. What follows is an explanation of Dr. Rifes instrument that has been learned through research, and the tying together of theories from many different avenues of science. This knowledge has led me to improve on the device, and to obtain patents which protect the unique methods and electrical concepts that make my device work. As a society, we are primarily oriented towards a chemical explantion of biological processes. Various theories, and applications of those theories, have been applied to the explantion of life, health, and disease. The use of biochemical solutions to disease has served us well. Many people ( including myself) owe our lives and well being to the use of medications developed using the biochemical model. In spite of successes, the biochemical model is fraught with philosophic traps. What appears to work well on paper, often does not in application. A medication that should be safe and effective, may only be effective, while also being highly toxic. All too often a newly synthesized compound when tested, is both inefective and toxic. Something very important has been overlooked in our present biochemical model. The solution is found in the study of BioElectroChemistry. On a fundamental level, all biochemical reactions are Electro Magnetic. Atoms and molecules are composed of charged particles which are in constant motion and vibration. Atomic, Molecular, and bond orbitals are just a way of saying that electrical charges are moving about an axis, within certain distance parameters set by the energetics of the system. Increases of energy within the system produces a corresponding increase of bond vibrational rates and can institute a variety of what are known as chemical reactions. Overlooked, is that charged particles are actually interacting, and charged particles, through the laws of electromagnetism can easily be manipulated. Recognition of these laws, and their application within our bodies can, and already have, yielded new theories, new medications, and new treatments of human illness. As an introduction, I am going to discuss a few principles of electricity. When read, please begin thinking in terms of the body. Our bodies are a complex matrix of various electrical components. These components include; conductors, semiconductors, resistors, capacitors, inductors, and charge carriers such as ions, proteins, colloids, and crystals. All charges depend upon some sort of conduction system in order for the charges to move. In our bodies, charged particle flow may occur in association with cells, blood vessels, lymphatic ducts, inter and extracellular fluids, or any other biological analog of what might be considered a wire. When one discusses electricity, what one is really talking about is the movement of electrons. Electrons can be gained or lost from an object leaving the object with a net negative or positive charge. These charges can be relative. That is, an object may be negative due to a loss of electrons, but considered as positive in relation to the overall negative charge of it's surroundings. By gaining or loosing electrons, our bodies utilize many different charge carriers. For example, metallic ions such as K, Na, Mg, and Hyrodgen act as positive charge carriers. Negative charge carriers would be Cl, hydroxal ions, phosphates, sulphates, and electrons to name few. When electrons or any charged particles flow along a conductor, an electrical current is produced. This electrical current gives rise to what is known as an electrical field. The higher the number of charges flowing in the conductor, the higher the current. As these charges move in the conductor, a magnetic field is also produced. In short, a charged particle that moves creates both an electrical and magnetic field! The force or push behind the charges moving in the conductor is known as the potential, or as it is more commonly called, the voltage. The higher the voltage, the higher the push or force on the charges. In summation, high voltages give rise to high electrical fields, and high currents give rise to high magnetic fields. The reverse is also true, a high magnetic field can create a large current in a conductor, and a high electrical field can create a high voltage in a conductor. On an atomic level, the basis of understanding of biochemical reactions lies in an understanding of electrons. Electrons are of primary importance in the establishement of a particular atoms or compound's chemical properties. These properties are often expressed as the ionization potential and electron affinity. That is how easily an atom will gain or lose electrons. In context of this discussion, the application of an external electrical or magnetic field to the body will directly effect all the electrical properties and electrical component (semiconductors resistors, capacitors etc. ) analogs of the body. The end result will be an effect upon the bodies chemical and thus physiologic activities. Well established Scientific methods known as Electrokinetics, utilize the electrical properties of various compounds and charged ions to manipulate and analyze them. A few well known methods are Zeta Potential, pH, Isokinetics,Isoelectrics, Electrophoresis, Dielectrophoresis, Magnetophoresis, Electroacoustics, Magnetoacoustics, Streaming Potential, Sedimentation Potential, Electrostatics, Dynamic Mobility, Entrainment, and Resonance ( Magnetic, acoustic, electrical, mechanical ) . There are two electrokinetic methods known as Electro-Osmosis and Electroendocytosis respectively, which are of significant importance to the use of frequency type devices. Some of these terms will be discussed more thoroughly a little farther down in this web page. The scientific foundation for the utilization, application, understanding, and further development of Electrical, Magnetic, Electro-Magnetic, and Acoustic based frequency devices is very solid. What is lacking is research. Application of these known principles to treatment has yielded empirical outcomes and results which are so common as to make the use of frequency devices a growing world wide phenomenon. A phenomena with an estimated 400,000 frequency devices and another 600,000 electrical therapeutic devices in usage just here in the USA. Usage that for the most part, is entirely outside the mainstream medical/pharmaceutical system. A shock to many within the mainstream model is that 25% of the United States health care professionals are not medical. Members of the Natural Health Care professions care total nearly 250,000 and care for an approximate 60 to 70 million Americans yearly, and it is these same Americans ( taxpayers & voters) who primarily own and utilize these devices. The application of pulsed fields for therapeutic usage relies upon the ability of the body to absorb the field. Dr. Rife's Device or as some call it, a " Rife Machine " used a variable carrier frequency, pulsed radio transmitter to produce a special wave that was capable of coupling its energy to the human body. There are several important methods that are utilized to achieve energetic coupling. One technique Dr. Rife used to make the wave of his machine couple to the body was through the use of a special antenna. Instead of using a metal antenna, Dr. Rife's instrument coupled the pulsed output from the radio transmitter to a gas filled, glass tube with closely opposed electrodes. This special tube is technically known as a Phaontron Diode. The output energy from the radio transmitter ( the RF wave ) caused the gas to form a plasma and then glow when in operation. One should think of a neon sign tube for a comparison. 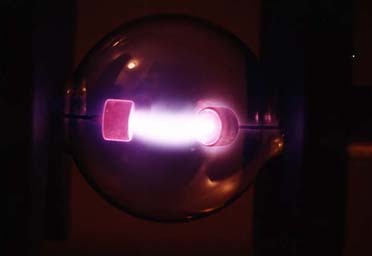 The Phanotron Diode was filled with an inert gas, or mixture of gasses such as argon, neon, or helium. Different gasses give off different colors or spectra. For example, Neon is orange, Argon is purple mauve, and Helium is pinkish white-gray. Helium phanotron tubes at high pressures are ideal for use with extremely high modulation frequencies ( MHz). This is due to the resistance and quenching effects of Helium gas to RF. For treatment purposes, Dr. Rife separated the phanotron tube from the rest of the devices equipment, and placed about 8 to 12 inches from the patient. One of Dr. Rife's discoveries was that the Phanotron tube was made part of the carrier frequency oscillator circuit. By placing the tube close to the patient, a resonant coupling would occur, and the oscillaton frequency of the devices carrier wave would adjust to the electrical properties of the patient. Modern Phanotron tube, made in the Ukraine by Econika, for use with my device. My patented, and easily constructed instrument, like Dr. Rife's, utilizes a radio energy excited gas plasma tube as an antenna. A few of the manufacturers web sites making plasma tubes for my device can be found on the Links page. Dr. Rife's device was a near field instrument, that is, the tube had to be placed within 8 to 12 inches of the patient. My patented discoveries have created a device which is a far field instrument, the tube is generally used about 6 feet ( two meters ) from the patient. There is evidence, that the wave emitted from the plasma tube of my device, if un-impeeded by walls, has an effective radius in excess of 30 feet. Unlike my device, the majority of commercial frequency devices now available to the public utilize electrical principles which have no relationship whatsoever to Dr. Rife's original plasma tube device. Yes, they do work to some degree, but have a limited capability to manipulate the charges and physiology of the body.The manufacturers of many frequency instruments often rely upon the phenomena of " Credibility Through Association ". That is, they call their devices a " Rife Machine ", or a " Rife " this or that.If considering the purchase of a machine it is paramount to understand what it is you are purchasing.Are you buying a machine which bases it's claims of effectiveness solely upon name association with a deceased individual? Or are you purchasing a machine which is based upon research, scientific understanding, international patents, and government approval? The technical content of this introduction stands as testament to the scientific principles whereby my device produces physiologic effects. The effective field of up to 30 feet ( 9 meters) , makes my device usable for simultaneous exposures of groups of people. Exposure of groups in excess of 100 or more people is possible. This is the only device in the world capable of such large group exposures. Dr. Rife's commercial machines known as a Beam Ray ( This is NOT the same electrically or functionally as the current commercial units which have adopted the same name ) was capable of only treating one person at a time. My device is simple to construct, one merely follows the directions like baking a cake. For those that might be daunted with construction, easy to assemble complete parts kits and completed devices are available from licensed suppliers. By using off the shelf components, the instrument goes together easily. One doesn't have to understand the chemistry behind a cake to make one. The directions are simple and straightforward. Most of the separate parts of equipment that compose the device, simply connect together. In fact, most of the 5000 plus devices now in existence were self constructed. The popularity and effectiveness of my device has created a small but growing world wide industry. An industry that is dedicated to both the production of parts and completed devices. I do not have any financial arrangements, or relationships regarding the distribution or selling of parts for the device. Be assured that all parts that are listed in my book have been tested by me personally for both reliability and effectiveness. Please see my web sites Links Pagefor some of the businesses that supply the demand for parts . My book has a full listing of all presently known parts suppliers. A better understanding of the Rife Machines' history and how it came to be lost to humanity can be found in the book by Barry Lynes entitled " The Rife Report, The Cancer Cure That Worked, Fifty Years of Supression ". I do not sell this book, but it is available from several sources on the web. One source for the book is found at this link. The effects of my device are entirely non thermal in nature. That is, no heating of tissue occurs in normal operation. As to safety considerations, a well made device easily meets FCC requirements for RF emission safety levels.The amount of RF emitted from a well made device travels significantly less distance than the RF wave of a cell phone. Cell phones are placed right next to a persons head. My device is used at a distance of 6 feet, where the measured RF field is almost non detectable. In order to understand how the my device works it is necessary to discuss a few laws of physics and chemistry. When RF energy is emitted from some source (an antenna), it can be absorbed by an object when impedances match. Impedance is a measure of resistance - so when the impedance of the wave emitted from the plasma tube, and that of some part of the body match, energy is transferred or coupled. Impedance is a function that is related to frequency. My device produces not one frequency, but through the phenomena of harmonics, creates many thousands of frequencies simultaneously. Thus, energy transfers easily into a person, and does so through user defined selectivity. That is, by choosing different fundamental operational ( modulation) frequencies, the user chooses and creates different impedances. The creation of many thousands of different frequencies occurs through the use of an AM type radio transmitter that is severely overmodulated. That is to say excessive amounts of audio are put onto the carrier wave. Normally such excessive audio, when demodulated would create distortion. By modulating a square audio wave, no demodulation distortion will occur. The demodulated wave form will be identical to the modulated wave form. Overmodulation creates a pulse of RF energy which is electrically shaped so that the rise and fall time of the pulse is very fast ( less than 3 millionths of a second! ). Rise time is how fast the pulse is formed, and the fall time is how fast the pulse is cut off. The plasma tube acts like an electrical mixer which creates harmonics, overtones, and heterodyne products . Very much akin to a musical instrument. A string can be set to vibrate at a certain note, but how that note sounds is dependent upon the instrument the string is attached to. The string could be in a piano, a violin, or a guitar and all will sound different even though they play the same note. This difference between the instruments is due to the generation of frequencies different from that of the fundamental note. Something very special occurs to the RF energy emitted by the transmitter within the plasma tube. Due to the shape of the plasma tube -i.e. a cylndrical or round radiator,the traditional hertzian RF wave radiated by a metal antenna, is converted into what is known as a Zenneck Wave. A Zenneck wave is a non hertzian RF wave whose field strength drops off as the square root of distance from the tube ( antenna). Different audio frequencies are input to the RF transmitter, and used to produce different physiologic effects. Changes in the audio frequency applied to the transmitter, will produce a corresponding change in impedance values of the Zenneck wave. You can read more about Zenneck waves at these web sites. Once the Zenneck wave has coupled to the body, the audio energy in the wave can be demodulated or stripped off the carrier wave. Think of tuning a radio to 100 on the AM dial, to listen to music. The radio recieves the 1 MHz signal, then demodulates the music. This is what happens in the body. Demodulation can occur at several different places in the body, such as at cell or organelle membranes, interstitial spaces, areas of adjacent but different impedances, and so on. What is important is that the demodulated audio will produce an electrical signal ( voltage ) local to the point of demodulation! If the point of demodulation is a cell membrane, then the electrical charge will occur across the cell membrane. Exposure times at each modulated audio frequency are in minutes. Thus the demodulated voltage is present for at the site of demodulation for minutes at a time! The physiologic consequencies of an externally induced electrical charge at the cell membrane can be significant, and is an area of current main stream research. My device, as did Dr. Rifes', relies upon the phenomena of resonance in order to produce many of it's physiologic effects. Most people think of resonance in terms of a glass breaking when exposed to an audio frequency. A resonant response by an object does not have to be just from stimulation with acoustic frequencies. There are many other types of resonances that can occur. There are resonances to light, radio waves, magnetic waves ( such as used in MRI ), X-Rays and other forms of ionizing radiation. The fundamental physical law that relates to the operation of my device is known as Kirchoff's Principle. Kirchoff's principle states: " The frequency of energy absorbed by a molecule is equal to the frequency of the energy emitted by the molecule ". Kirchoff's principle is the basis of spectrographic analysis. Spectrographic analysis is used to show the resonant response of chemicals, bacteria, viruses, and objects to a frequency range of vibration. For example, how a molecule or object responds to a range of audio frequencies is known as an acoustic spectrograph. A spectrograph can be made using frequencies from those of the audio region through those of frequencies associated with Radio waves, light, and up through ionizing radiation ( X-Rays, etc. ). Once the energy of the wave emitted from the plasma tube is in the body, it can create physiologic effects by matching the spectral absorbtion/emission frequencies that the molecules and tissues of the body produce. The significance of Kirchoff's Principle is that the wave emitted from the plasma tube of my device produces spectra that includes those of electrical and magnetic fields, acoustic, RF and light. Simply by changing tubes, gasses, RF carriers, pulse rates and other variables, it is possible to tailor the spectral output of the device to a cell or tissues specific specific spectral resonant point. As a practical application, the system utilizes tubes and RF emission that create extremely wide bandwidths of emissions. Only the audio modulation frequency is varied. One may thus simultaneously influence multiple resonance frequencies of a cell or organism across many different bands of frequencies! Entrainment is associated with the phase of oscillation of an object. That is to simplisticly say, as an object oscillates it is moving up and down at some particular rate. At a particular point in time, the object can be up, down, or or somewhere in between. Entrainment forces two objects to be in phase so that they move in synchrony. That is, they are up at the same time and down at the same time. When the phase of two resonant oscillations match ( in phase ), energy will transfer and summate to the resonant receiver of the transmitted energy. If the phases do not match, ( are out of phase ) the energies of the transmitter and reciever will cancel each other out! Even though they are resonant. A phase relationship also exists at the RF level. 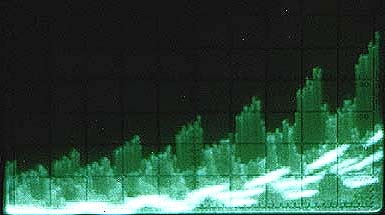 This is found in the sidebands of the RF transmission from my device. The side bands emitted from my device contain harmonic frequencies which are generated at many different phases within the bandwidth of each sideband. Energy thus transfers in phase from my device even without entrainment. Entrainment does intensify the efficiency of the energy transfer! You can see the harmonics in the sidebands of my device on my web page showing Spectral Analyzer Pictures. Spectral output of a portion of one sideband generated by the plasma tube. In this picture are hundreds of vertical lines, each single vertical line is an individual freqency. All of these hundreds of frequencies are generated simultaneously, and each frequency is harmonically related. Each of these frequencies has a unique phase angle and impedance value within the side band. Changes in the audio frequency will create an entirely different set of frequencies. The Zenneck pulse radiated by the plasma tube, and resultant demodulated electrical/audio pulse is produced by applying different square wave audio frequencies to the transmitter. Audio frequencies are those frequencies that are in the range of our hearing. In fact, the device, although it lacks a loudspeaker, actually sings and audibly emits the audio tone that is being input to it. The demodulated Zenneck wave from my device can produce an acoustic wave, and thus mechanical resonance effects! The various membranes ( plasma, nuclear, mitochondrial, etc. ) of the cell are analogous to a capacitor and will collect electrical charges. A voltage applied across a cell membrane will change the tension and thus curvature of that membrane. A pulsed voltage at a specific frequency will cause the membrane to oscillate as it contracts and relaxes between each electrical pulse. The outer plasma membrane will collect electrical charges that are no shorter than 1 microsecond in length. The intra cellular mebranes of the various organelles will continue to collect electrical charges into the low nanosecond range. The pulses produced by my device are generally in the milisecond range, thus ensuring that electrical charges accumulate both on the exterior and interior of the cell. The outer membrane of the cell is connected to the cells interior through a tensegrity matrix which is akin to the wires that hold up a suspension bridge. In this case the " wires " support the internal components of the cell. Oscillation of the outer membrane will cause internal oscillation of the cell via the tensegrity matrix . Thus, pulsed electrical signals can produce a mechanical resonance effect. Mechanical resonance is created when a small periodic stimulus of the same natural vibration period of a cell, tissue, or even a molecule, is used to produce a large amplitude vibration of the cell,tissue, or molecule. If the induced resonant vibration is intense enough, the cell, tissue, or molecule will be shattered. Mechanical stimulation and resonace effects on the interior of cells should have a direct action upon the many different enzymes found within cells. Enzymes rely upon an activation energy in order to intiate catalytic reactions. This activation energy is kinetically based, and may be enhanced through mechanical stimulation of the cell. The rates of enzymatic cellular reactions depend upon the frequency with which an enzyme collides with its substrate. Mechanical stimulation of a cell will produce a mixing of the molecules within a cell and thus increase the number of molecular collisions per unit time. It is also possible that mechanical stimulation may have a " detangling " effect on the folded conformation of proteins. Present development of my device allows for the passage of frequencies over 200,000 Hz! Frequencies above 20,000 Hz are known as ultrasonic. It is possible some dynamic physiologic effects may be found through use of the device in the ultrasound regions. It is now known that all plasma tubes produce emissions of ultrasound from stimulation of the glass envelope of the tube. These ultrasonic emissions extend only about 2 feet from the tube. Dr. Rife used his phanotron tube within this 2 foot distance. It is presently believed that ultrasound emissions were a contributing factor to the invitro effects Dr. Rife achieved on test tubes and petri dish cultures. So similar is my patented device to the operation of Dr. Rife's machine, that those who have used it, have given the name of the Rife/Bare or R/B device. I did not name the device such. This name has grown out the respect and benefit the many tens, if not hundreds of thousands of people worldwide, have had from exposure to my device. Frequencies for my device come from a variety of sources. Many are empirically derived. That is, from observed responses based on application. The CRC Handbook of Chemistry and Physics has a formula in which one may convert molecular mass to frequency. That is, if one knows the mass of a molecule, one may deterimine the resonant frequency of that molecule. The formula is F= Mass X 2.2523442e+23. By dividing down by factors of 2 ( 2,4,8,256, 512 etc,) one may utilize a harmonic frequency to achieve stimulation through resonant sympathetic vibration. Other frequencies come from a patent pending theorm discovered by Charlene Boehm. There have been significant positive responses to the utilization of Ms. Boehm's with my device. Ms. Boehm has written short explanation of her theorm for my web site. Another two interesting methods of frequency derivation have been developed by Juliana Brooks M.D. These methods have been issued PCT's and have a multitude of applications, which include the development of new medications and the treatment of disease utilizing various wavelengths and frequencies of energy. You can read more about Dr. Brooks patents at her web site. The electrical signal that is generated from the demodulated wave of my device occurs local to the point of demodulation! This electrical signal/pulse is present for minutes at a time. What this means, is that a local electrical field of only a few tens of millivolts needs to be applied across cell membranes to cause effects. One of the methods via which the device produces effects is called electroendocytosis. Electroendocytosis is the electrical enhancement of endocytosis through the application of very weak electrical fields. This process occurs with field strengths of from 20 to 70 volts per centimeter! Endocytosis is the process whereby cells fold a piece of thier outer plasma membrane around molecules that are too large to be transported across or through the membrane. A small vesicle is formed around the molecule. Exocytosis is the process whereby the vesicle once it has released it's enclosed molecule returns to and reforms with the plasma membrane. If the process of endocytosis far exceeds the process of exocytosis, the cell will run out of enough plasma membrane to support itself and fail/die. Electro-osmosis is the electrical field enhanced action of osmosis. One should think of this as related to active transport of charged ions across the cell plasma membranes. Excessive voltage at the cell plasma membrane will tend to create a reorganization of of the charges that are normally present and cause a flow of ions into or out of the cell. Cells normally maintain a 60 to 100 mv voltage potential between the inner and outer plasma membrane. A cancer cell has only a potential gradient of from only 20 to 30 mv! By adding charges to the cell membrane, the abnormal physiology that cancer cells need to exist and function will become disrupted. Electro-osmosis and electroendocytosis seem to be responsible for the reports of enhanced effects from the use of the device concomitantly with chemotherapeutic regimines. There have been very consistent positive reports of the use of the device with low dosage chemotherapy. This is a subject worthy of extensive clinical investigation. Traditionally, when the physiologic effects of RF are determined, the scientific community thinks mainly in terms of the field strengths of the electrical and magnetic waves produced by the RF transmitter. RF waves are actually motional magnetic and electrical waves. Each wave ( E & M ) creates a line of force, this line ( an axis ) of force is known as a vector. The combination of the vectors created by EM fields is known as the Poynting vector. Only a few within the scientific community have considered the effects of demodulation of EM waves and their vector resultant at a local ( cellular) level . The Poynting Vector is analgous to what is known as the Lorentz Force. Cells are filled with charged particles, which, as previously mentioned, can be set in motion through mechanical stimulation of the cell membrane. A charged particle, when in motion produces a magnetic field that rotates around the axis of displacement of the particle . The Lorentz force, is the force exerted on a charged particle moving with a certain velocity within an Electro Magnetic field. The Poynting vector ( Lorentz Force ) may result in an effect known as Fluctuation Driven Transport (FDT). FDT is a process whereby an external oscillating or fluctuating/pulsed electric field, substitutes for the energy derived by ATP hydrolysis in cells. Inside a cell, FDT can result in actuation of the vectoral transport mechanisms of molecular motors and ion pumps.The use of extreme overmodulation by the transmitter of my device produces a very intense demodulated signal. This intense demodulated signal is the basis of my patents, and the method which produces physiologic effects. As the resonance targeted micro organisms or abnormal tissue cells are exposed to the minutes long effects of the demodulated wave, they can break apart and create a debris. This debris can often be noticed as a discolored or highly odorous urine. One may also notice a difference in the color and smell of ones stools as the body detoxes. It is thought that this cellular debris acts as a stimulant to the immune system. The debris may act as an antigen causing the production of antibodies. In effect, a form of immunization against the disease may occur. Another important method through which my device functions is known as Voltage Dependent Ion Gating ( VDIG ). The ion channels in many types of cells,( especially nerves and muscles ) can be opened through the presence of an external voltage . I presently believe this is the primary manner in which the device produces many of the observed physiologic effects on the nervous system. By creating a charge differential on the cell plasma membranes, the device has been able cause pain relief, for which it is now certified for use by Health Canada. VDG occurs in an electrical field of only 1/10 the intensity necessary to produce electroporation. When the demodulated voltage affects the membranes of other types of cells that are subject to VDIG, then some very dramatic physiologic effects become possible. The voltage differential created by demodulation is thought to produce a gradient flow of ions, primarily calcium, potassium, and sodium, across the cell wall. This results in an imbalanced osmotic pressure which may cause the cell to slowly swell and finally shatter . Shatter just like the picture of the paramecium found at the top of this page. Voltage Dependent Ion Gating is frequency dependent, and closely allied with the cells Zeta potential and pH. pH may be manipulated electrically through the process known as EChT or ElectroChemical Treatment. EChT is used to treat tumors through the insertion of needle electrodes into the tumor. A migration of ions ensues, with disruption of cellular membrane potentials, and changes in local pH. This causes the cell to necrose or undergo apotosis. Below is an oscilloscope picture taken of the output wave from my device. The wave was generated by a plasma tube excited by a 300 watt radio transmitter, operating at 3000 pulses per second. The pulse envelope, has both leading and trailing edge electrical spikes of less than 4 micro (millionths!) seconds in width. Modifications which are listed in my book produce extremely fast rise and fall times of the pulse envelope. Rise and Fall times under 3 microseconds (millionths of a second ! ) are typical. Such fast rise/fall times create a stronger wave that impacts the resonant cells in a more effective manner. This is because of Faradays Law. An RF wave is a transmitted oscillating magnetic and electrical field. Faradays law states that the induced voltage in an inductor is proportional to the rate of change of the magnetic field. The faster the magnetic field turns on and off ( rise and fall times ) the greater will be the induced voltage. Another factor is presently hypothesized from Newton's second law of motion. I won't discuss this here, but the pulse envelope shape may have much to do with the ability to impart force ( a shock wave?) or energy into a cell or tissue. Pulse rate of 3000 Hz. Rise/Fall times 1 microsecond. Leading edge spike of less than 4 microseconds duration, and trailing edge spike measured at less than 3 microseconds duration. Other methods via which the device produces effects can be found in various published scientific papers relating to the effects of sonic resonances on cells, and the non thermal effects of RF fields on bacteria cultures. Some areas of present interest are magneto- strictive and Widemann effects upon cells. There are numerous research papers and patents involving the use of pulsed electrical, magnetic,and RF fields on micro organisms and tumors which help to explain the devices effects. An interesting patented, clincally tested, and FDA approved product that utilizes specific radio frequencies to up regulate specific genes is the Regensis Device . The Regenesis device will decrease wound healing time by 70% through manipulation of gene expression. To review some of these patents and research papers on pulsed fields, go to the Electro-Plasma Digest website. This web site also contains a large number of original letters, pictures, and published articles about Dr. Rife and his machine. I've created a new term for the use of resonant energies to create physiologic effects. This is an acronym of Dr. Rife's name. Electrical Frequency Devices are not new, and are in fact in widespread current usage in Traditional Medical Practice. It is just that few tend to think of these as frequency instruments. The following are just a few of the electrical frequency instruments in present therapeutic medical use. Muscle stimulators which relieve pain, reduce spasms and edema, tonify weak muscles, and assist the healing process, run at from 1 to 130 Hz. TENS units are used to block pain run at about 80 to 100 Hz. Interferential Therapy units are a type of muscle stimulator run at 3000 to 4000 Hz. Bio Feedback instruments used to modify behavior and retrain the nervous and muscular systems, run from below 1Hz to about 40 Hz. Bone Growth Stimulators, used to heal broken bones run at frequencies from about 40 to 80 Hz. Deep Brain Stimulators - use implanted electrodes to impart electrical pulses from between 120 and 160 Hz directly to the brain to control involuntary muscular tremors in Parkinson's disease. Heart Pacemakers use an electrical impulse to regulate the hearts rhythm. These are just a few of the current electrical frequency devices in use. My device has demonstrated many different physiologic effects from it's usage. Using known frequencies, exposure often causes the subject to fall to sleep, especially if the subject is extremely ill, or is emotionally distraught. Another aspect of the device is its ability to produce an extreme vitalizing effect, which is believed related to the influence of extra charges within the body. This is somewhat related to the concept of Acupuncture wherein body energies are moved about to establish a balanced state. There have consistently been very encouraging reports of the devices effects on the symptom's of people suffering with Fibromyalgia. These informational reports from users are not claiming proved efficacy. There have been very encouraging reports with both Osteo and Rheumatiod arthritis. The device does not reverse the destructive effects of these diseases. Rather it seems to relieve the pain, inflammation, stiffness, and to some degree the lack of mobility associated with the damaged joints. Effects from a single exposure can last from several hours to a few weeks. Daily exposures produce optimal effects in these conditions. From user reports, frequent exposure has a cumulative effect and has contributed significantly to the afflicted's quality of life. I have had seasonal viral infections just like most of us. The difference is that I have been consistently able to clear most of these within 12 hours after an exposure. I am not making claims here about the treatment of virally based human disease. What I am saying, is that instead of suffering for two to three weeks, I recovered significantly faster . The use of the device on disease in humans is worthy of further investigation in a more appropriate clinical manner. Anecdotal reports from constructor - users of the device has shown rather dramatic effects on Herpes Virus outbreaks, Lyme disease, and an assortment of different bacterial infections. Please be aware these reports are anecdotal, and I am not making claims for the devices efficacy. Rather pointing out the important need for further clinical investigation. My devices' effects, on Cancer needs further investigation. I will state that my device is presently not an actual cure for cancer. Nor am I aware of any frequency device , regardless of it's principles of operation that are. If someone with cancer responds to any frequency device, that is ,their tumors may shrink and their lab tests normalize, they must continue exposures. Without continuing exposures, the cancer will return. There seems to be a residual type of pre-cancer cell that once one stops exposures, allows the cancer to come back. Even though the device is not a cure for cancer, I can say that there are people who have significantly exceeded predicted survival times. These people had a terminal prognosis, with so certain an outcome that their Dr. was able to estimate their remaining lifetime. Many who have used the device, are still here, some are now working as productive members of society, in spite of their predicted demise. From the reports of users, the device presently seems to provide a viable treatment that has both significantly prolonged survival times and increased the quality of life in some, but most certainly, not all people. Please be aware that if a person has a prognosis of only a few weeks to live, and tries a frequency device, the results have been universally poor. The degree of response to frequency devices seems to be directly related to the overall ability of a persons body to respond and rebuild.If there is massive cancerous invasion of various organ systems with associated failure of the organs, the results of exposure are very meager. But there have been reports from people with multiple metastatic sites that have responded well to the device.These people responded, as the damage done by the cancer was not severe enough to be immediately life threatening. Further our bodies seem to heal sites of prior tumors with scar tissue. Meaning that an organ damaged by cancer may still shows signs of impaired function after the tumor is destroyed. I must point out, that treatment protocol is not fully developed for cancer, and any use of the device is done at the users own risk. please click on the highlighted link. My instrument is a solid state device, which makes the parts freely available and construction simple. As a first step in construction, my book shows you how to easily modify the primary transmitter ( a common CB radio ). This modification produces; a greater bandwidth, more harmonics that will fit in the widened bandwidth, and an RF pulse.These three factors taken together are then output into a linear amplifier which lacks any harmonic suppression. For the technically versed, the transmitter should be thought of as an amplitude modulated, diminished carrier , dual side band type. My device is not a square wave modulated CW transmitter! Such transmitters only provide about 25% of their available energy to what are known as sidebands. It is the sidebands that undergo demodulation, and produce the local electrical field. Thus, in a square wave modulated CW transmitter, for every 100 watts of transmitter power, only 25 watts will be available for demodulation. The output from the linear amplifier results in a 10 to 25 fold power increase of both the audio fundamental and all the harmonics present . The final 140 to 250 watt output from the linear amplifier is then fed into an Antenna Tuner which is connected to a Plasma Tube.The Antenna Tuner matches the RF and the Plasma Tube creating dramatic increases in the units efficiency. The use of a Plasma Tube is the final vital component part necessary to the devices operation. Besides the conversion of the input RF wave into a complex Zenneck wave with many individual harmonics, the tube acts like a fast switch. That is, the tube turns on and off at the applied audio frequency. Thus modulating the light energy. 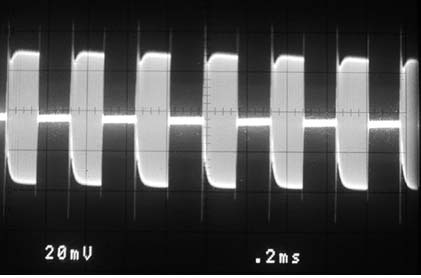 Measurements with an ultrasound detector have shown the the glass envelope of the tube emits an ultrasonic spherical field. This field extends in an envelope about 2 feet from the tube. These ultrasonic waves are created by a ringing of the glass, induced by the tube acting as a switch. It is presently hypothesized that this ultrasonic field is partially responsible for some of the invitro testing effects Dr. Rife is noted for. Test tubes or petri dishes are not good antennas for a transmitted RF based wave! But at 12 inches from a phanotron tube, test tubes and petri dishes are being affected by a resonant ultrasonic wave. The various waves emitted from the plasma tube creates an evenly distributed field that has excellent whole body penetration. To understand how the plasma wave works, one must think in terms of tissue saturation or permeation. The wave passes easily through the body, but as it does, the audio or resonant frequency portion is stripped off ( demodulated). The deeper the wave penetrates, the less audio that will be available. Present modified transmitters produce over 40 watts of modulated audio energy before being amplified. This assures a surplus of energy which is sufficient to work with all sizes of people. Another way to consider the effects of the R/B device is by a variation in Faraday's Law. Basically the current induced in an inductor ( our bodies have inductance )can be expressed by this equation. Current Induced= Frequency X Length of the Body X Field Strength. This equation is important for it means the the power absorbed and generated by the wave within the body is proportional to the size i.e. length of the body. To state this more clearly, the device automatically compensates for a small animal, child, or an adult! One can put a small animal in the field produced by a 200 watt device and not have to worry about over exposure due to the strength of the field! The effects of different types of glass, tubes, and Noble Gasses are discussed in the book. Different gasses produce different spectra, and thus will produce different resonant/physiologic effects. Neon for example is vitalizing, sedating, warming ( due to its Infra Red output), muscle relaxing, and pain relieving. Argon has a very wide spectral emission, and thus is the preferred gas that is used with my device. It is vitalizing, cooling, sedating or stimulating depending on the applied audio frequency. Argon can also be pain relieving, and most importantly ,it has intense devitalizing and in some cases destructive effects on micro organisms. This machine I have developed, produces effects and results that when when judged against the current health care methodologies appear somewhat unbelievable. A discussion about my device, written by an engineer can be found at this site. Although the preceeding statements of this web page may seem to be gross exaggeration, in reality the statements are severe understatements. For more specifics, join one of the Rife lists. These can be joined by writing a letter to one or all ofthe following addresses.Please put the word subscribe on the subject line of he letter. The latest web resource for public interaction on the works of Rife is found at The Rife Forum. Here you will find a variety of different public forums relating to the many different facets of RIFE devices and therapy.
" Resonant Frequency Therapy - Building the Rife/Bare Device " contains 23 short illustrated Chapters covering; the development, full construction, and operation of the device. As a true bonus a set of audio treatment frequencies taken from the Plasma Tube Rife Device once owned by an M.D. in the mid to late 1950's is included. This Dr.made accurate measurements of the treatment frequencies of his machine prior to the machines demise. Pictures of an actual Rife Ray tube and Beam Ray device produced in 1947 are also included. Considerable space is taken to explore the transmitters; basis of operation, Plasma Tubes, noble gasses, and problems inherent in operation. Attention is given to details in construction that make the process relatively easy. Two separate devices are discussed, a low power device that does not need a linear amplifier, and a high power device that utilizes the linear amplifier. I do not sell completed machines or individual parts for the machines. Completed machines, and ready to assemble parts kits built under license to my electrical specifications are available from sources found here . The licensure contract ensures that reliability and service to the customer is paramount. A complete list of individual parts suppliers for those that would like to construct their own device, is given in the book. All parts are easily available ready made off the shelf. Further, I have no financial relationship with any of these same suppliers. No one part is overpriced, or difficult to obtain. All parts have both; multiple redundancies, and suppliers, letting you mix and match as you desire . Minimal tools such as a screw driver, soldering gun, side cutters, and the like are necessary for construction. No expensive electrical test equipment is required. The only electrical testing instrument necessary is an easy to use digital multi meter which costs about 40 dollars. I have labored to produce a book that is understandable by those not versed in electronics, as many readers who would otherwise be interested, might feel daunted by unknown electronic complexities. Through a series of simple explanations, the reader will be guided through the technical aspects of the devices operation. An Understanding Of The Electrical Theory Of How The Device Works Is Not Necessary For The Devices Construction ! Actual construction time is about four hours including some parts chasing. Most of the parts are available with only a phone call, and once acquired, just connect together. I realize that my foregoing explanation may be intimidating to many people that have had no experience with electronic devices outside of maybe turning a TV or radio on and off. Once assembled however,the device is very easy to operate. The device is designed so that it broadcasts on a radio band allocated for use by the FCC for Industrial, Scientific, and Medical Devices (27.12 Mhz which is channel 14). Very little RF energy is actually radiated from the device. In doing microscopic testing, I operate the device within 5 feet of over 3000 dollars in electronics, including a TV, video cameras, VCR's, and oscilloscopes with minimal to no interference. We live in the information age, and now that information so long forgotten, so long suppressed, can be yours. This device is for real, as are the effects of its use. Construction should not be undertaken without some consideration as to how the device will be utilized. The use of this device should be for experimental and investigative purposes only. This book opens a new technology to humanity, and has been used by several people to date to create entirely new classes of frequency devices.
" Resonant Frequency Therapy - Building The Rife/Bare Device " is available either by phone order or by mail. We accept Master Card and Visa Cards, both domestic and foreign. If ordering from out of the USA, please send any cashiers checks or money orders payable in US funds. Full size detailed blueprint of the Rife Prismatic Microscope body are now available! Proceed to Order Page to order Book, Video Tape, or Microscope Plans. Audio Tapes and Real Audio downloads of my multiple radio interviews done for the Laura Lee Show, and Jeff Rense's Sightings are available. Due to the large number of sites now offering information and research on my device, a separate link page has been established.The links page also lists web sites which sell assembled devices, plasma tubes, square wave generators, and all the other parts necessary for construction of the device . The use of pulsed fields in the treatment of disease is an area of growing scientific research and interest. Please visit the following web sites for more information. Pictures of a 1947 Rife Unit! The Frequency Update Page updates the growing data base of frequencies that have been reported as having physiologic effects. My links page lists several sites with more extensive frequency lists. A picture page with a few of the R/B devices people have constructed is now online!